Τhe south-west pier of the Harbour of Lions was adorned with two beautiful marble monuments: the Large Monument (1st century BC) and the Small Monument (1st century AD). 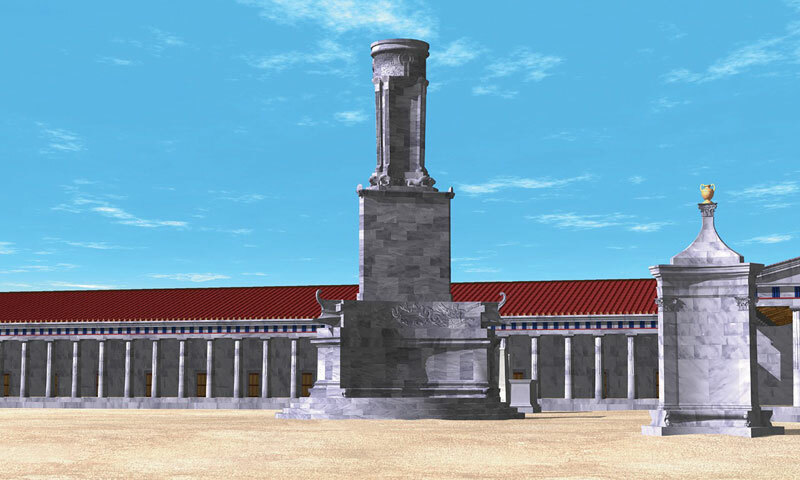 The Large Monument of the harbour was situated in front of the west wing of the Harbour Stoa. It consisted of four levels, one on top of the other, and its total height reached approximately 18 metres. The structure of the lower part followed the form of a typical votive exedra. 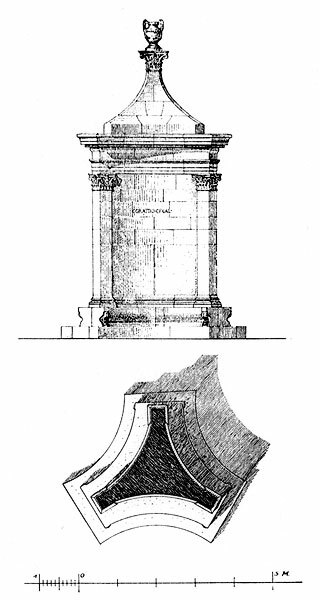 A socle clad with concave orthostats and crowned with mouldings, was placed on a four-stepped crepidoma of approximately 10 metres-diameter. A 0.37 m. wide marble bench ran along the socle. Above the crowning cornice lay a second, similar triangular base, which curved sides were ornamented by a low relief depicting scenes of Tritons and dolphins, ending in sculpted ship prows. There was a third triangular base of smaller dimensions. On its sides were dedicatory inscriptions from various periods. The initial inscription has not been preserved. It seems that the Large Monument was initially dedicated to Pompeius, the famous persecutor of the pirates who ravaged the cities of the Asia Minor coast, who was especially honoured by the city of Miletus in 63 BC.According to the following inscription, the monument was subsequently dedicated to Augustus, in commemoration of his victory in the naval battle of Actium (31 BC): ΑΥΤΟΚΡΑΤΟΡΙ ΚΑΙΣΑΡΙ ΘΕΩ ΘΕΟΥ ΥΙΩ ΣΕΒΑΣΤΩ Ο ΔΗΜΟΣ ΜΙΛΗΣΙΩΝ. TO THE VENERABLE EMPEROR CAESAR, GOD AND SON OF GOD, THE DEMUS OF MILESIANS (DEVOTES). The symbols (cross, bird, anchor), preserved in relief above the inscription, date back to the early Byzantine period, where a marble tripod supporting a cauldron stood. The main sculptural section of the monument stood above the successive bases. It consisted of a 7,5 m. high marble tripod supporting a cauldron. 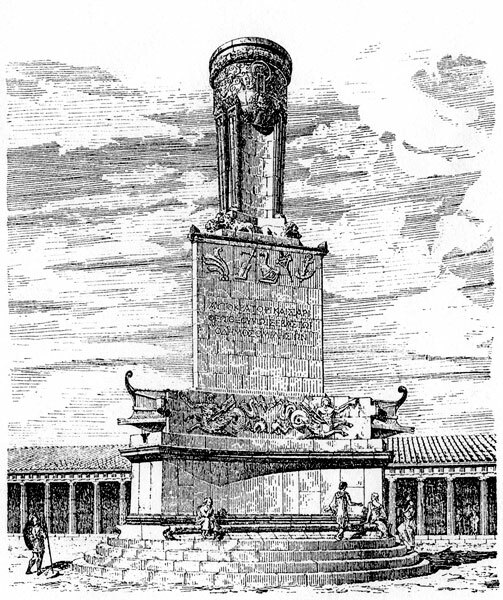 The monumental tripod rested on a low triangular base with two sculpted lions, the symbol of the city of Miletus, in each corner. The Large Monument was preserved at least until the 6th century AD,when the wall of Justinian was built, which included all the facilities in the area of the Harbour of the Lions. Only the circular lower base of the monument has been preserved. 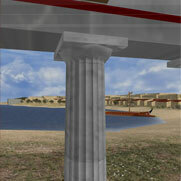 The Small Monument was situated on the south-west pier of the Harbour of Lions, in front of the west wing of the Harbour Stoa. It was built during the 1st century AD, not far from the Large Monument (1st century BC). Its form betrays an obvious influence by the Large Monument (1st century BC), but its total height is only 5.36 metres. A 0.37 metre-wide perimetric bench was built on a one-step triangular crepis of the same width, with pronouncedly concave sides. 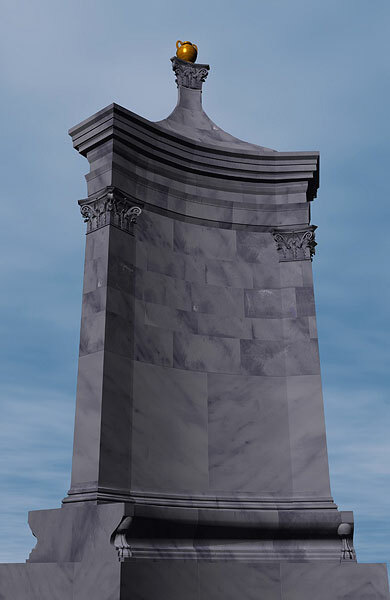 The tall core of the monument was also triangular and had pronouncedly concave sides. Its three points were shaped as antae with Corinthian capitals. On one of the sides of the triangular platform, this dedicatory inscription is preserved: C. GRATTIO C. F. GAL(ERIA). This refers to a person who lived in the period of the Flavius dynasty (69-96 AD). The edifice had a roof in the form of a pyramid of curved faces with cut edges, which concluded in a triangular Corinthian capital. On the top of the roof there was a marble amphora. The Small Monument was entirely made of marble. Its architecture is less original than that of the Large Monument, and echoes the funerary monuments of Magna Graecia.